In 2006 WHO (World Health Organization) described the status of PMTCT service implementation as unacceptable, with an urgent need for a renewed public health approach to improve access to HIV prevention, treatment and care services . Research in rural Malawi described that PMTCT can be an empowering process, which can profoundly influence women's experience of pregnancy and child birth . For PMTCT to be effective it needs to be accessible, acceptable and affordable, and a series of steps need to take place, but there are difficulties in the implementation of each step . The purpose of this qualitative study, carried out in rural Malawi, was to explore the views and perceptions of PMTCT antiretroviral treatment held by rural women, family members and health workers, in order to identify issues that facilitate and impede adherence to nevirapine. The voices and experiences of rural women have been largely neglected to date in discussions on PMTCT in Africa. Research in Africa on the accessibility and uptake of PMTCT and strategies to improve these has focussed mainly on women who deliver in hospitals [4, 3, 5]. Research into adherence to PMTCT has also been predominantly urban based. Albrecht et al. showed excellent adherence rates to nevirapine of 94% for mothers and 91% for babies in Lusaka, Zambia; maternal non-adherence was associated with home births, no high school education and low newborn birth weight. Among those who had home births, lack of HIV status disclosure to one's partner was a significant predictor of non-adherence. The acceptability of PMTCT in urban African contexts, e.g. Akwa, Gabarone, Abidjan and Lusaka, has been impeded by disbelief in its effectiveness, negative attitudes of health workers and lack of male support; economic affordability constrained by distance and transport costs; and social affordability impeded by stigma, discrimination and the fear of abuse and divorce after partner disclosure [7–10]. The importance of involving other community members to strengthen both PMTCT uptake and adherence, and to support women emotionally, was advocated in urban Swaziland  and in the Eastern Cape, South Africa . Encouraging the involvement of men in PMTCT services in Nairobi through antenatal couple counselling led to increased uptake of interventions, including the use of nevirapine by the mother . Qualitative methods were used as they are well placed to identify and address issues because they are capable of exploring different views and identifying concepts and interpretations to understand the social world through people's experiences and stories [20, 21]. Semi-structured interviews were used as they provide a description of the actions, ideas and experiences of the participants in their own words . Focus group discussions (FGDs) were appropriate as they are helpful in finding out how and why people behave as they do . The research took place in April/May 2008 in a district hospital and villages of that district, in a rural part of Malawi's central region. Sampling was purposive and sometimes opportunistic: participants were those community members who were identified in this and other studies as influencing the actions of women in labour, i.e. antenatal and postnatal women, men who are fathers, traditional birth attendants (TBAs), grandmothers, community leaders and PMTCT health workers. TBAs were identified by hospital staff; mothers, fathers, community leaders and grandmothers were indentified in the TBAs' and surrounding villages. Each TBA had an antenatal clinic with a delivery room, and they advised which day to come to see the antenatal women attending their clinics. A group of fathers playing a traditional game in one village agreed to participate in a focus group. TBAs and chiefs identified older women in their communities. Interviews and focus group discussions (FGDs) took place in the hospital (Table 1), in TBAs' clinics, under trees, in an empty school and in the research vehicle (in all cases privacy and confidentiality were assured). Written consent was obtained from every participant in their local language; participation was voluntary and under an agreement to keep details confidential. 3 Interviews in English were conducted by D.A.O'G., trained in qualitative research; the remaining interviews and all the FGDs were conducted by two trained, experienced Malawian research assistants in Chichewa, the local language, and all were recorded. Data was transcribed directly into English by the research assistants: translations were periodically checked through discussion and by comparing transcripts to the notes taken (in English) at the time of the interview/FGD. MAXQDA software was used to facilitate coding and mapping of data. The framework analysis  was used in order to ensure comprehensive, rigorous, logical analysis of the data. Ethical approval for the research was obtained from the ethics committee of Liverpool School of Tropical Medicine in England and from the National Health Sciences Research Committee, Malawi. 2 broad themes of findings emerged: facilitators and barriers that relate to the hospital PMTCT service, and those that relate to the community. All participants, with the exception of 2 grandmothers, knew that there is a medicine (nevirapine) for pregnant women to take to prevent HIV from passing into their baby and a medicine for the baby. Participants were asked who should know that the baby needs to be brought to the hospital: only 2 women said that they alone should know; otherwise women, men, PMTCT health workers and TBAs said both parents, or parents and a grandmother, or parents and an aunt and other relatives, or parents and the TBA should know. Likewise when asked who should bring the baby to the hospital for nevirapine syrup this was seen as the sole responsibility of the mother by only one woman; instead frequently it was seen as both the mother's and father's task, or the task of the grandmother or other relatives. Two TBAs suggested they could do it. Only one man suggested that men cannot bring a baby to the hospital. TBAs are important members of the community; one man described their role by saying 'TBAs are part of us here'; a man in a FGD said that they 'are our mothers', however, another man said they are 'after money'. Almost all participants thought that TBAs should play some role in PMTCT, from their recently established role of referring antenatal women for PMTCT testing and referring those who are infected to hospital for delivery, to counselling, educating, dispensing PMTCT drugs and reminding women to swallow them, and taking the baby to the hospital for nevirapine syrup, if they were trained. In one FGD some women suggested that TBAs should be the people who do testing and who dispense nevirapine, but this was rejected by others in the FGD as TBAs do not have the equipment to test for HIV. Two PMTCT health workers expressed that the advantages of involving TBAs were that they live and work in the community and could provide this service to women who don't live near a hospital; the other two PMTCT health workers were less enthusiastic about the idea because of TBAs' lack of education and lack of knowledge about PMTCT. TBAs themselves were keen to be involved; they acknowledged their lack of equipment for HIV testing, but were eager to help antenatal women by counselling and providing nevirapine. The findings of this study show that there are many perceived barriers to swallowing nevirapine: some concerning the PMTCT service in the hospital, others community based and some relating to both the hospital service and the community. The qualitative nature of this study allowed exploration of the views and perceptions of members of the community not usually included in research about PMTCT. A key theme of this study is that participants do not consider that PMTCT is the sole responsibility of the mother. Only one woman and one chief thought that bringing the baby to a health facility to receive nevirapine syrup was a role for the woman alone. The constraints of distance, health worker attitudes, and pain and bleeding postpartum mirror the issues found by Leigh et al  in their study of access to emergency obstetric care in Malawi. Most participants, including men, suggested that the husband could bring the baby, and that other family members and traditional birth attendants could also be involved. This suggestion contrasts starkly with the lack of role and responsibility for men in their wives' labour and delivery described in this and another study in Malawi , and appears to mark a change from the traditional attitude to men's participation. Women discussed issues around forgetting to swallow nevirapine because they had nobody to remind them: the presence of fathers when many women start labour makes them a clear choice to remind women. This willingness of men to be included presents an opportunity to engage them in the antenatal and postnatal care of women and babies as maternity services expand to include prevention of HIV infection. Grandmothers were one of the strongest influences on the behaviour of women in labour who deliver at home: the success of PMTCT will be impeded if these influential people are not informed about PMTCT and of its importance [11, 12]. They are often the first people to be informed by a woman that she has started labour, and so, like husbands, are ideally placed to remind women to swallow nevirapine for those women who choose to disclose their status to their mother or mother in law. The perception that PMTCT is not the sole responsibility of pregnant women is not reflected in the way the service is currently delivered through the hospital's antenatal clinic, which uses the biomedical model of a health provider with a patient who is an non-contributing, though cooperative, recipient of care . The influences on a pregnant woman are strong: her peers, grandmothers, family, traditional birth attendants and culture, yet, as observed in this study, she attends the hospital for antenatal care alone. Women play important productive and reproductive roles in society : the biopsychosocial model of health care in which societal values and culture are considered can offer solutions for a more appropriate PMTCT service, as pregnant women are part of a family and a community, and babies are born into that family and community . Some HIV services already take place in community settings removed from health facilities. Voluntary counselling and testing sites are often geographically separate from HIV treatment services, and counsellors may not be medically trained; likewise the HIV counselling and testing step in PMTCT could be separate from the dispensing of antiretroviral medicine to the mother, and could be carried out by community members, for example, the TBAs. For those women who use them, TBAs are ideally placed to undertake the counselling and testing (CT) role: they are already involved in antenatal care, they are local, they are generally trusted, and, as has been found elsewhere, they are willing . This should be no more stigmatising than current services. TBAs, however, have not received confidentiality training, which, as has been noted , is a necessity for a counsellor, and further research would be required to assess the impact of TBAs and barriers to their inclusion in PMTCT. If TBAs and family members were allowed to store nevirapine syrup then more babies could access it, as many of the barriers to babies getting nevirapine in the hospital reflected distance to the hospital, fear of abuse from the PMTCT workers there and stigma arising from making that journey. This would mirror the guardian-based provision of anti-tuberculosis drugs in the DOT (directly observed treatment) programme , which has been successful in Malawi [32, 33]. The local storage of nevirapine would also mean that nevirapine syrup is available for the baby very soon after birth: giving nevirapine to the baby soon after delivery is more effective than later . In Malawi in 2004 almost three quarters of home deliveries were in rural areas and 58% of those delivering at home had received no antenatal care. TBAs, who conducted 29% of rural deliveries in 2004, live in villages and are known in communities, and are in a much better position to access pregnant women than hospital based PMTCT workers are, possibly by active case finding; likewise family members are trusted and accessible for many women. The TBAs in this study had recently received training from midwives in the district hospital about the referral of antenatal patients for PMTCT testing; further involvement and training of TBAs could be part of the task-shifting programme of WHO, already established in Malawi, and would relieve the workload of health workers that are already in short supply . The constraints to the involvement of family members and TBAs need to be considered: participation will not be applicable to all family members or all TBAs, and will need to be negotiated with women so that it reflects their individual wishes, realities and personal choices on disclosure. The possible benefits and limiting factors to their involvement in PMTCT are summarised below in Figure 2. Advantages and constraints to involving TBAs, grandmothers and fathers in PMTCT. The Malawian PMTCT package requires that women attend formal health services before and 3 days after birth; some effort has been made to include men in the service through couple counselling. However the reality for some women is that all their maternity services are community based, through clinics run by TBAs: attending a hospital for maternity services is not a feasible choice, and their decisions about maternity care are mediated through the community in which they live. This is a small, qualitative study carried out over a short time in one rural district of Malawi which cannot fully elucidate all aspects of this issue. It was carried out in a rural area because rural women are least likely to adhere to nevirapine; the findings may not be applicable to urban areas where services and barriers are likely to be dissimilar, and they also may not apply to other rural areas where traditions and influences are different. Time and logistical constraints meant that data were transcribed directly into English which did not allow independent verifications of translations. This study suggests that PMTCT is a community issue which requires a community response. 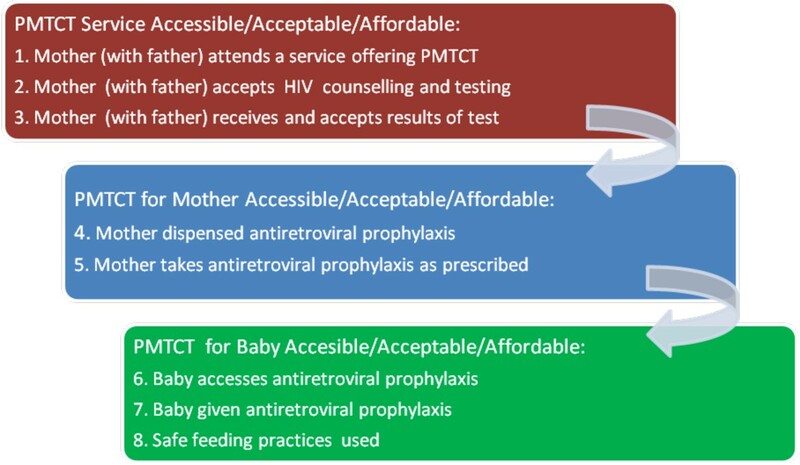 PMTCT services are not currently accessible, acceptable and affordable for all rural women; innovative strategies which include the involvement of different community members are needed to improve this, and therefore help this community to prevent HIV infection in its children. To meet WHO's call for stronger more public health orientated approaches to PMTCT, and to increase the practical knowledge-base on what works for poor rural women, there is an urgent need for further implementation research to evaluate and scale-up successful approaches. 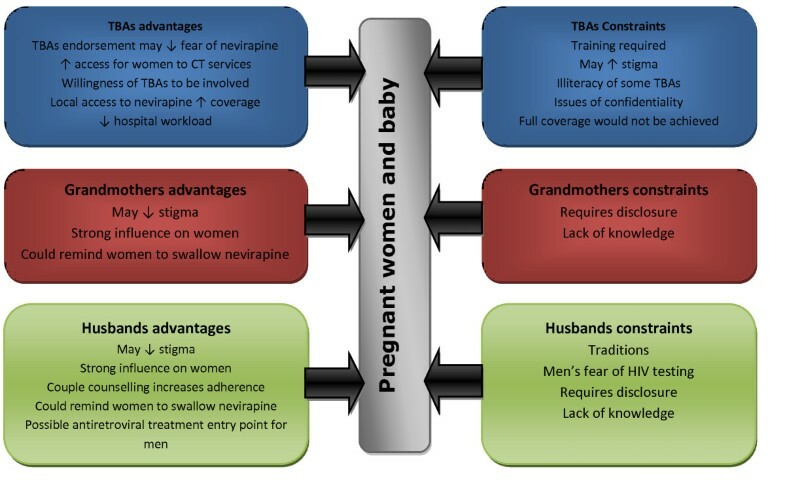 This research shows the importance of involving TBAs in some aspects of PMTCT services, and asking women which community members (for example grandmothers, husbands, TBAs), if any, they would like to support them in ensuring their newborn babies receive nevirapine. Without further innovation in this area PMTCT will remain inequitable and ineffective and out of reach of many poor rural women in Sub-Saharan Africa with wide reaching implications for future generations. 1. Introduction of moderator and recorder, explanation of recording equipment and issues of confidentiality. 2. Description of HIV transmission from mother to baby by moderator. 3. Knowledge about PMTCT, particularly ART in PMTCT. Why at home and not in a health centre? Who knows it needs to be done? If difficult, what needs to change about it? How will that fit in with current labour practices? What are the issues about a newborn baby taking treatment after birth for a week or 4 weeks? What are the issues about pregnant women taking treatment every day for the last 3 months of their pregnancies? 1. Familiarisation with the data. 2. Identification of a thematic framework. 3. Coding. 4. Charting. 5. Mapping/Interpretation. Many thanks to community members in this district of rural Lilongwe for sharing their valuable time and to REACH Trust, Malawi for hosting and supporting this project. Thanks also to Dr. K. Bristow for valuable comments. The Kenneth Newell bursary assisted during the preparation of this paper. D.A.O'G. designed and led the study, and drafted this paper. LN supported the study process, and the analysis and commented on the paper. ST supported overall study design, including analysis, and paper writing. All authors have read and approved the final manuscript.